This article originally appeared in St. Cloud Times on Monday, April 14, 2014. As a native of Malaysia, these are the questions I get bombarded with almost anywhere I go since the MH370 tragedy broke March 8. Because I am not residing in Malaysia and have received only secondhand news, I avoid the topic each time someone asks about the tragic incident, my opinions on conspiracy theories, and our government’s responses to the event. Whenever necessary, I choose not to speak about the missing plane conundrum. Instead, I criticize how this incident has become a global sensation, especially through social media, by attracting international attention and sparkling lots of superfluous — and rather inaccurate — “expert” knowledge on the subject matter. Those who have been in the loop should be quite familiar with the narrative about the disappearance of Malaysian Airlines Flight MH370: The plane took off March 8 from Kuala Lumpur International Airport heading for Beijing. At about 1:22 a.m., Vietnamese air traffic control noticed they had lost contact with MH370. The Boeing 777 carrying 227 passengers and 12 crew has not been seen or heard from since. During the past month, international support was expanded from the U.S. to Australia, rallying to gather facts and hints that will help search missions. Along with that came thousands of armchair critics and self-proclaimed experts of aviation, many firing gibberish and offering ridiculous explainations. Social media commentator Ren Yi told The Associated Press social media has been augmenting a general sense of negativity toward Malaysia by giving voice to rumors, doubts, speculations and paranoia, while seeming to offer family members false hope. Some claimed aliens were involved while others believed the Bermuda Triangle had a twin sister in the Gulf of Thailand. As for conspiracy theorists, most point to the possibilities of hijacking, terrorist attack and theft. According to AP reports, accounts forwarded on Chinese social media have it that the plane is being held hostage in Central Asia, that Malaysia shot it down because of possible hijackers wanted to crash into the capital city’s twin towers, or that the U.S. diverted it to a remote island to prevent secret information from reaching China. Even within the Malaysian circle — my friends and families in my social networks — social commentaries seemed to focus only on the incompetence of our leaders. Some of them took the opportunity to frame the incident as a politically motivated catastrophe. Regardless of what we believe to be true, many social media users have yet to learn to distinguish facts from fiction. Many people simply take quick looks at news stories from unknown sources and distribute them obnoxiously within their own networks. 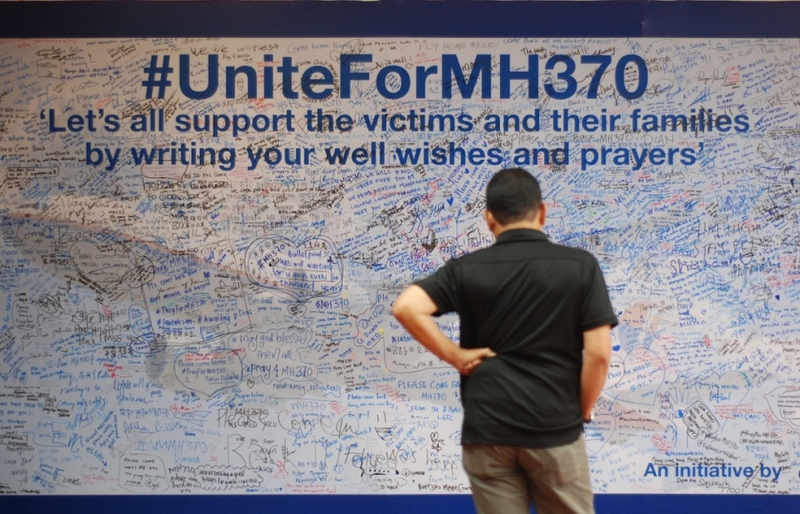 Anything marked with “#MH370” was deemed newsworthy by them and shared and re-shared virally. Of course, it doesn’t help when a major news channel such as CNN keeps sensationalizing the story with all kinds of specialist perspectives and postulations. Most of my friends won’t question the accuracy of information if it comes from a U.S. network like CNN. And with the seductive headlines and savvy presentations about the flight disaster put together by these major networks, they make the information even more believable and encourage audience to disseminate them. The result for uninformed users is they are deceived by misinformation. Families were given false hope. Most Malaysians were misrepresented as incapable individuals. Cynicism and distrust are filling airwaves, and they are not helpful to the collaborative search. Although it’s understandable for people to get emotional when a disaster happens, we should be cautious about what we do or say, online and offline. Words are powerful. Given the MH370 tragedy, we don’t need further nuisances. Instead, we should remain concerned and act with empathy. Don’t spread any more hearsay. Focus on proven facts.